Henry Lee Einsel, 88, of Fremont, OH passed away on Monday, February 4, 2019 at Bethesda Care Center. He was born April 14, 1930 in Clinton Twp., OH, the son of David W. and Naomi D. (Williams) Einsel, Sr. He was a 1948 graduate of Columbian High School and received a bachelor’s degree in Humanities and History from Kansas State University in 1966. Henry served in the U.S. Army for twenty-six years and retired from service on September 30, 1977. During his military career he was awarded the Good Conduct Medal; Armed Forces Expeditionary Medal; National Defense Service Medal w/1OLC; Army of Occupation Medal; Armed Forces Reserve Medal w/X YR Device; Bronze Star Medal; Vietnam Service Medal; Vietnam Campaign Medal; 4 overseas Bars; Vietnam Cross of Gallantry w/Palm and Meritorious Service Medal (1OLC). Henry served in the U.S.; Germany; Thailand; Vietnam; P.I. ; Guam and his last overseas assignment was in Japan. Henry married Mary (McClenathan) Halbisen on August 31, 2005 and she survives. He was a retired horse owner and lessor. He was a member of Sacred Heart Catholic Church, AM VETS, DAV, USTA and TROA. He was a former member of the Tiffin Masonic Bodies, Moose Club, American Legion and VFW. Henry enjoyed fishing and was a competitor and master shooter placing at the Camp Perry National Rifle Matches. Henry is survived by his wife, Mary Einsel, Fremont, OH; children, Henry Lee (Lisa) Einsel, Jr., Alexandria, VA, Ann L. (Jeff) Shellhammer, Tiffin, OH, Amy L. Einsel, Elyria, OH, Laura L. Einsel, Lakewood, OH and Dawn F. Einsel, Los Angeles, CA; former wives, Susan F. Einsel, Clyde, OH and Leona G. Einsel, Bloomville, OH. 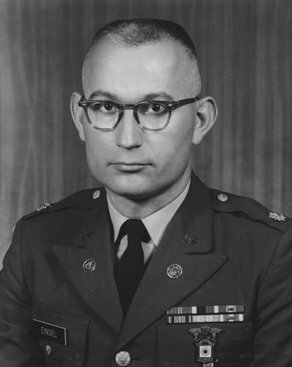 He was preceded in death by his parents; brothers, Major General David W. Einsel, Jr. USA RET and Lt. Col. Willis E. Einsel USAF RET. Visitation: Friday from 4 to 8 p.m. at Wonderly Horvath Hanes Funeral Home and Crematory, 425 E State St., Fremont, OH with a vigil service at 7:30 p.m.
Mass of Christian Burial: Saturday, February 9, 2019; 10:00 a.m. at Sacred Heart Catholic Church, 550 Smith Rd., Fremont, OH with Fr. Chris Kardzis officiating. Burial: McPherson Cemetery, Clyde, OH on Monday, February 11, 2019 at 10 a.m. with military honors. I will remember my Stepfather as an officer and a gentleman a well educated individual, with much resilience. It was an honor to know him, he loved his nation, he was an astute listener, and very generous. I will miss his intelligence, and enlightening conversations, and his appreciation for my culinary skills. Much Love Henry Lee Einsel Sr. I am so sorry for your loss. May God comfort your mourning hearts. I pray that you find comfort in Revelation 21:3-5. This scripture paints a picture of a world that is very different from what we see today. A world with no more sickness, pain or death…and it is not a dream, it is a promise from God. He promises to reverse the effects of death and resurrect your precious one. You will never have to say a painful goodbye ever again!